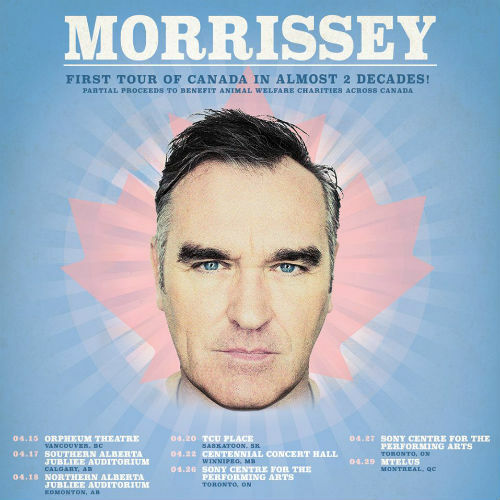 Morrissey has announced 2019 tour dates that will see the English singer-songwriter traveling through Canada. This will be his first tour through the country in almost twenty years because he had boycotted Canada due to the inhumane practice of seal hunting, hoping to get the laws changed. This week, he decided to end the boycott although seal hunting is still legal, explaining on his website that the stance was "ultimately of no use and helped no one" and instead proceeds from ticket sales will go towards animal welfare charities in Canada. The former Smiths frontman hits the Great White North in April, with eight performances currently lined up. However, fans or the singer may be weary that the concerts will go as planned given his numerous cancellations over recent years, as seen in the most liked Facebook comment in response to the announcement. Updated April 15, 2019: Due to a "medical emergency" several dates have been postponed, with some already rescheduled for October. When do Morrissey 2019 tour tickets go on sale and what is the presale code? The general public on-sale begins as early as February 22. Presales for American Express cardmembers and local venues / radio begin on February 21. American Express cardmembers can use the password INGOLD for the presale, but you will need an AmEx card to complete your purchase. Keep in mind, each date is different and details are subject to change. Click through the individual concert links for more information about the show you're interested in. Pick up his album Low In High School on Amazon. For more, check out Morrissey's Zumic artist page.